International patients will most likely arrive through Frankfurt Airport, which is only 30-45 min north from Heidelberg or through Stuttgart Airport which is approx. 60 minutes south. It may be most convenient for you to use one of the limousine services to directly pick you up at the airport for a direct transfer to Heidelberg. Please let us know if you want us to arrange this for you. Alternatively, you may want to use the very fast and comfortable ICE trains that stop directly in Frankfurt Airport and take you to Heidelberg via Mannheim Railway station where you change into the local trains to Heidelberg that run every 10 min. The entire journey will last no more than approx. 45 – 60 min. You will find all train connections on the web pages of Deutsche Bahn, the German Rail Company. From the north and the Frankfurt area you reach Heidelberg following the Autobahn / motorway signs A5 (direction Basel/Darmstadt) and from the south and the Stuttgart/Karlsruhe area via the A8/A5. Change to the A 656 leading you to Heidelberg. Within the city of Heidelberg you follow the signs that direct you to the Universitätsklinikum and then to the Kinderklinik If you are using a navigation system enter Im Neuenheimer Feld 430, Heidelberg. Parking space is available directly in front of the Children’s Hospital. You will find all train connections to and from Heidelberg on the web pages of the German Rail Company, DB Bahn. Please exit at Heidelberg Hauptbahnhof (Central Train Station). The Heidelberg Central Train Station is located south of the University Hospital. It takes about 10 minutes by car, taxi or bus to get here – for a better orientation view this google map. Please download this campus map to see where we are or use the Google map. The campus Im Neuenheimer Feld is abbreviated with these three letters INF. Our Hospital is signposted by the number 430. The public transport association VRN offers two busses, No 31 or No 32, which take you very close to our main entrance. The bus stop is called Neuenheim, Jugendherberge (Youth hostel). For an easy orientation view this map of the Neuenheimer Feld campus: Bus stops are indicated by the capital letter H and our location is signposted by the number 430. 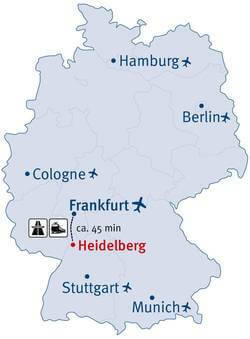 You can contact us for information or visit the website of the City of Heidelberg or of our International Office.